HELENA, Mont. 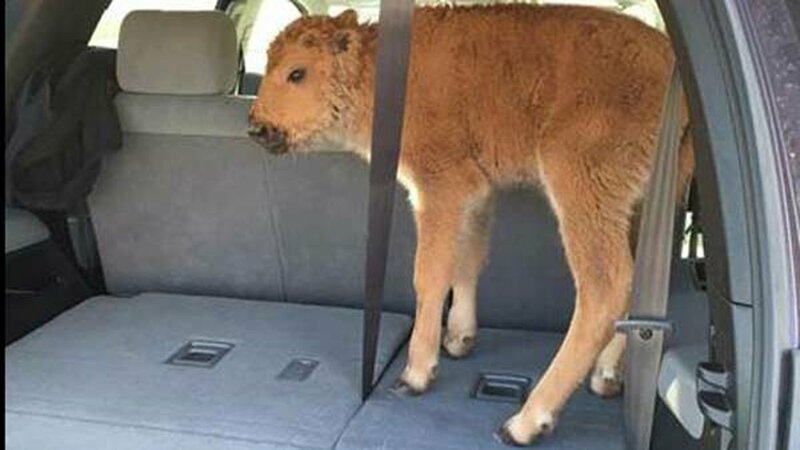 -- A Canadian man and his son loaded a Yellowstone National Park bison calf into their vehicle last month because they thought it was an abandoned newborn that would die without their help, the men said in their first interview since park officials had to euthanize the animal. The calf was killed because it couldn't be reunited with its herd after being handled by Shamash Kassam of Quebec, Canada, and his son, Shakeel Kassam, on May 9, park officials said. The encounter led to public outcry and renewed warnings by Yellowstone officials for visitors not to touch wildlife. Shamash Kassam was fined $235 and ordered to pay $500 to the Yellowstone Park Foundation Wildlife Protection Fund on Thursday after he pleaded guilty to a charge of intentionally disturbing wildlife. Kassam and his son told Good Morning America on Friday the calf approached them with its umbilical cord still attached. They put it in the back of their SUV in the belief that they were rescuing it. "We didn't have the heart to kind of just leave it there and let it suffer, you know, as the darkness descended," he said. "I thought it was going to be a happy ending, and the calf was going to be integrated with another herd, and everything was going to be fine. We had no idea it was going to turn out so bad like that," he added. Messages left at phone numbers listed for Shamash Kassam in Quebec and Shakeel Kassam in Alexandria, Virginia, were not immediately returned. Park rangers took the animal back to where it was picked up, but they could not reunite it with its herd. The calf was euthanized because it was continually approaching people and cars on the roadway, Yellowstone officials said. They warned that humans approaching wildlife can affect the animals' well-being and possibly cause mothers to reject their offspring. Shamash Kassam said he was shocked by the media coverage and the public response, particularly accusations that he and his son kidnapped the bison or picked it up because they thought it was cold. The animal was abandoned, and he believed Yellowstone had a place where abandoned animals could be cared for, as a game reserve in his native Tanzania does, he said. He would just leave the animal alone if he could do it over again. "It's the way they are in Yellowstone Park. They don't want to interfere with nature," he said.